Busch Gardens Tampa welcomes baby Zebra! 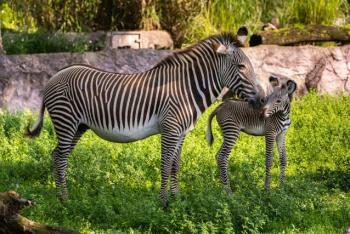 Busch Gardens Tampa welcomed an endangered Grevy’s zebra into the world on Monday, August 5. The baby was born to mother Brooke and father Two Step on Busch Gardens’ 65-acre Serengeti Plain. It is Brooke’s fifth foal and Two Step’s first. Within an hour of its birth, it could stand on its own and nurse. The gestation period for Grevy’s zebras is 13 months, and mothers usually give birth to only one foal at a time. In addition to the new foal, eight Grevy’s zebras – seven female and one male – live on Busch Gardens’ Serengeti Plain. The new foal, parents and the rest of the zebra herd can be seen from the Edge of Africa, the skyride or the Serengeti Express train ride. The Serengeti Safari, an open-bed truck tour of the Serengeti Plain, gives guests an even closer look at zebras, antelope and rhinos, plus the opportunity to hand-feed giraffes. The Grevy’s zebra population has declined by more than 50 percent in the last 18 years. They are the only zebra species listed as endangered by the IUCN Red List, which is considered the most comprehensive list of the conservation status of species in the world. The SeaWorld & Busch Gardens Conservation Fund has supported research and conservation of the Grevy’s zebra through a funding partnership with the Grevy’s Zebra Trust in Kenya since 2007. The Grevy’s Zebra Trust was established to conserve the species in the community rangelands of northern Kenya and southern Ethiopia by protecting and monitoring the zebra populations against poaching. The partnership between the Fund and the Trust is raising local awareness and developing a long-term community-led conservation program for Grevy’s zebra.